Hi we are Sushi Sho Masa! Booked this a bit late but thanks to Voyagin's wonderful customer service, I was able to get a reservation. I had a great dining experience. This was a really special experience. 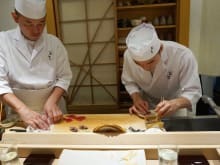 Seating only for 6, and it was the longest and most varied omakase I've ever experienced. Chef was friendly and extremely skilled, and the fish was extremely fresh and delicious. Well worth it! Chef and his staff were very friendly and explained every fish that they were serving, even showing pictures from a book. One of the chef's assistants will follow you out to greet you goodbye as you're leaving the restaurant. Yes that's the kind of service they provide! Each piece was made carefully by the chef with precise detail. I was able to try new kinds of fish that I had never been exposed to back in the states. Plus, it was delicious and fresh. It is definitely pricey so come prepared for it. Our bill came out to 52,000 yen with 2 glasses of beer and a glass of Coke. However, I think it's worth a try especially if you're a sushi/seafood lover. Had an amazing dinner at Sushi Sho Masa. Quaint little restaurant that seats 6 guests. 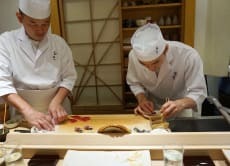 Chef Masakatsu Oka and his team were helpful and friendly, and the sushis were out of this world. Will definitely come back during my next visit to Tokyo.